Method: Take keema into a pressure cooker. 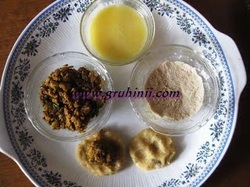 To it add a tea spoon of ginger garlic paste, half tea spoon red chilli powder, haldi, lemon juice and half tea spoon salt. MIx well and add cup of water. Cook for 6 to 8 whistles and allow it to cool. 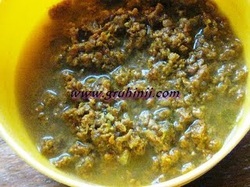 Coarsely grind the cooked keema in a mixie. Heat a table spoon of oil in a pan. Add chopped onions to it. Fry until the onions become translucent. Now add a tea spoon of ginger garlic paste, half tea spoon red chilli powder, dhaniya powder, salt to taste and garam masala powder. 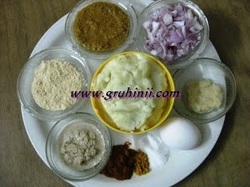 Fry for few seconds and add the khas khas-coconut paste. Fry for few sec. and add the keema to it. Now cook until the keema becomes dry. Add chopped mint/coriander leaves and keep it aside. Boil potatoes, peal and mash thoroughly. Add salt to taste and keep it aside. Beat egg and keep it aside. Now take a small lemon size ball of the mashed potato. Flatten it. (you can see in the pic. above) Fill the keema mixture in it. Now cover it with another flattened potato ball. Seal it properly. See that the filling do not come out. Make cutlets in the same manner. Heat a pan for shallow fry. Add some oil to it. Dip the cutlet in the beaten egg and dust it with the bread crumbs. Add some more oil around and shallow fry the cutlets in a medium flame until golden brown on both the sides.